It seems that everyone has a Yeti®, Coleman®, Ozark Trails® or similar tumbler. Why not give your tumbler a little personality with a full wrap decal? These decals are unlike other decals on the market as ours goes all of the way around the mug, and allow for full color printing, not just a single color cut out monogram. 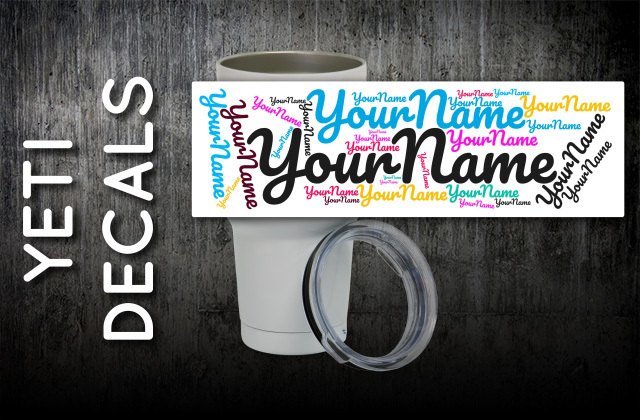 Make your tumbler stand out from all of the rest with one of our decals today! We also have mugs available for purchase which are equal to or better than some of the competition so you can purchase a completed product! Our decals are designed with the curve/taper of the tumbler in mind. As the tumblers have a slight taper you can't just put a straight/rectangle piece of artwork on your mug and have it fit. We can print your artwork on a curve which gives the illusion of a straight/flat piece of artwork that can be placed easily on the tumbler. Our decals are printed on an easy to apply vinyl ( you can easily remove decal with no residue to realign ) which will hold up so several hand washing cycles. Click Here to get a FREE quote from S&K for next Tumbler Decals printing job! Yeti®, Coleman®, Ozark Trails® are registered trademarks of their respective companies. We are not selling, licensing, endorsing any brand but referencing the style of tumblers that these companies provide. All of our products come with a possible 10% quantity +/- increase/decrease total. These will be mostly seen with larger quantity items such as our stickers/decals, dye sub transfer sheets, mousepads, etc where there are high quantities with the same artwork on each item. The customer will be responsible for any charges for these overages at the same rate per item along with rest of the quoted order.